Fairfield police aim to give the "boot" to parking scofflaws in Fairfield. 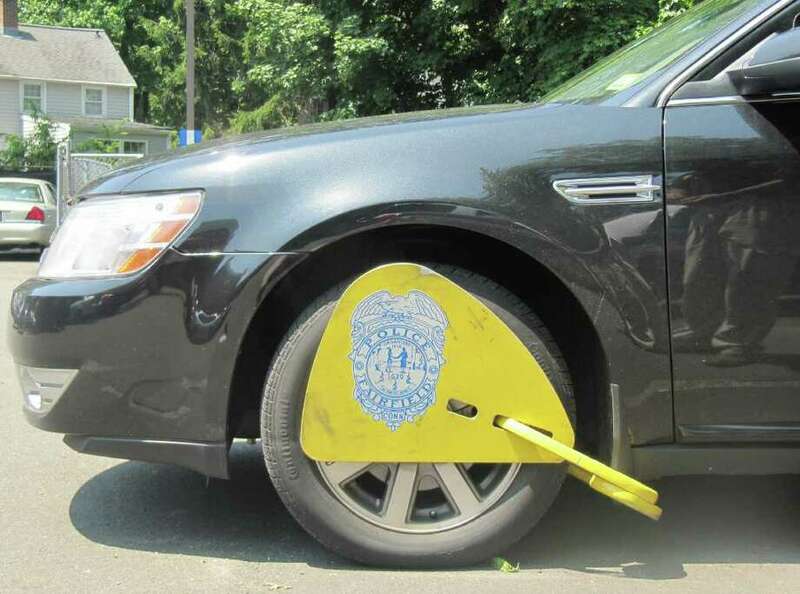 Frustrated over habitual parking violators, the Police Department has reinstituted the boot program, which immobilizes the wheel of a scofflaw's vehicle with a yellow locking device. The lock won't be removed until all delinquent parking tickets are paid, according to officer William Demotses, who has been a member of the department's traffic unit. "Last week, we booted a car whose owner owed $1,300," Demotses said. While the Police Department's website states a vehicle can be booted if the owner has a minimum $250 in parking tickets, Demotses said he's never been instructed to affix a boot on a car "for less than $800." "Our concentration is on those who are habitual and persistent avoiders of paying tickets, those who create an injustice to the town by completely disregarding their tickets," said Lt. James Perez, who on Friday became the traffic unit's commander. "They gave us the incentive to bring back the boot program." A parking ticket fine can range from as little as $25 to a high of $150 if the violation is parking illegally in a space reserved for the disabled. Unpaid fines increase the longer they remain delinquent. "Some people prioritize their bills, and the town is not necessarily the first on their list," Perez said. Demotses believes the boot program, inactive in Fairfield several years, will help change mindsets. "If people think that their car is going to get booted if they don't pay their tickets, they would be more likely to be more careful or pay their tickets on time," he said. "I think it's great for the town that we can collect our money," he added. Many of the most flagrant are railroad commuters, who either park at the train station or nearby streets without a parking permit, according to the Parking Violations Bureau. Individuals with multiple violations, at the latest count, owe tickets totaling $5,545. One woman, a Newtown resident, either a downtown area employee or commuter, owes $660 on one of her vehicles and $450 on the other. Combined, first-time and habitual offenders owe the town approximately $60,000 in parking fines. Failure to pay parking tickets does not currently prevent people from making transactions with the state Department of Motor Vehicles, unlike not paying local motor vehicle taxes. Demotses recently booted a car on Sanford Street while the driver happened to be standing on the sidewalk nearby talking on her cellphone. "She saw me booting the car, came in and paid immediately," he said. If anyone finds his or her vehicle booted, police advice is to not attempt to drive off while the lock is still in place. "You will completely damage your vehicle," Perez said.